Sarah’s debut as a FOX News contributor on the O’Reilly Factor on Tuesday drove up the ratings for that show just as it did for Oprah Winfrey’s show in November. The Nielsen ratings are in and former V.P. hopeful Sarah Palin hit the nearly 4 million viewer jackpot last night for her debut appearance on Fox News’s “The O’Reilly Factor” as a Fox News contributor. The count: 3,954,000 people tuned in to watch Palin last night. That number is up 42 percent from the same night last year, and up 26 percent compared to every other day of the show in January. Last night, Bill O’Reilly remarked that his show in which Sarah Palin debuted on FOX had more viewers than all the other networks combined. The New York Post confirmed that this morning. Sarah Palin was a smart hire for Fox News Channel, judging by the ratings for her debut on “The O’Reilly Factor” on Tuesday. The former Alaska governor’s first appearance as an analyst drew 3.954 million viewers — more than everything else on other cable new shows combined in the 8 p.m. hour. CNN’s “Campbell Brown” placed second with 999,000 total viewers, MSNBC’s “Countdown with Keith Olbermann” placed third with 906,000 total viewers and HLN’s “Nancy Grace” brought up the rear with 704,000. Compared to host Bill O’Reilly’s ratings the night before, the Palin push was worth a 22 percent rise in ratings, or more than 1 million more viewers including the repeat of O’Reilly’s show at 11 p.m. The former vice presidential candidate, who appeared yesterday for a full hour on Fox News with Glenn Beck, will be on “Oprah” today with James Cameron and Lady Gaga. I was browsing the magazine section at Barnes and Noble the other day when a particular magazine caught my eye. 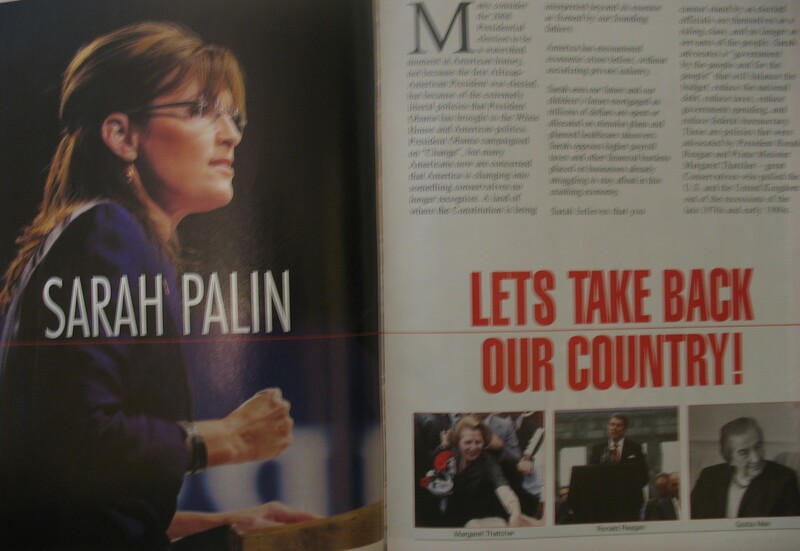 The title was “Historical Moments in Time: Sarah Palin”. Anything Sarah draws my attention but this one was different. 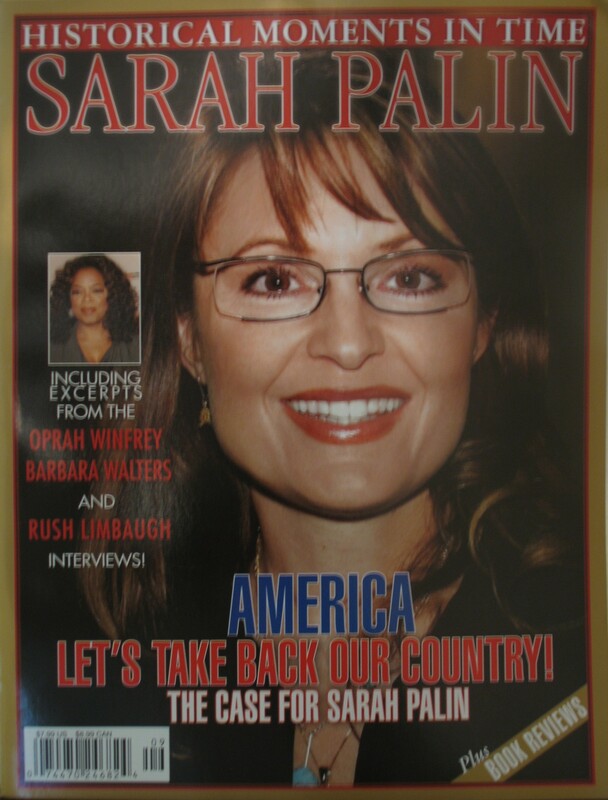 This magazine is all about Sarah and even includes excerpts from the Oprah Winfrey, Barbara Walters, and Rush Limbaugh interviews. The headline on the cover says it all “America Let’s Take Back Our Country! The Case for Sarah Palin”. You and I are told we must choose between a left or right but I suggest there is no such thing as a left or right. There is only an up or down. Up to man’s age-old dream0the maximum of individual freedom consistent with order-or down to the ant heap of totalitarianism. Regardless of their sincerity, their humanitarian motives, those who would sacrifice freedom for security have embarked on this downward path…The Founding Fathers knew a government can’t control the economy without controlling the people…the truth is that outside of its legitimate function, government does nothing as well or as economically as the private sector. 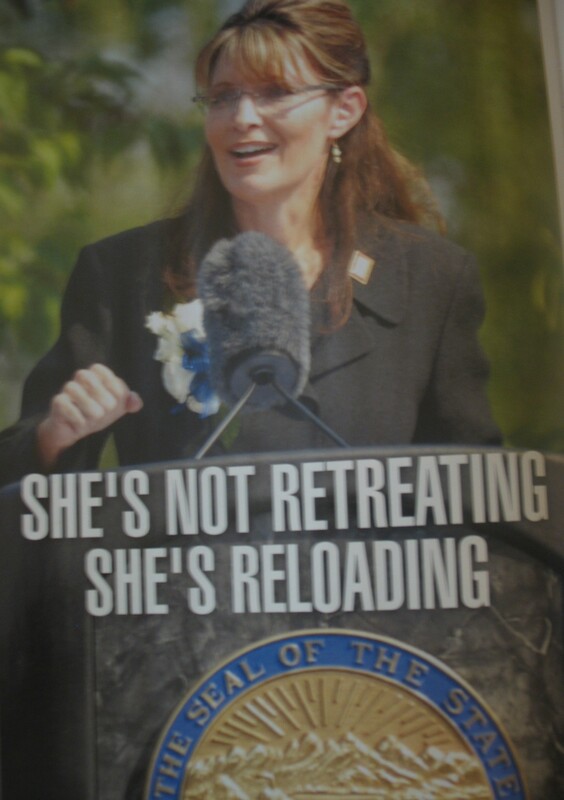 This magazine goes through Sarah’s rise on the national stage as well as her accomplishment as Governor of Alaska. These accomplishments include investing $5 billion in state savings, implementing a Senior Benefits Program that provides support for older, low-income Alaskans and an overhaul of education. The highlight of which had to be her “common-sense” oil and natural gas resource development. I’m sure that all Alaskans will remember Sarah as the pioneer who brought them a gas line. A Gas Pipeline is a key part of our state’s future. It will provide affordable energy and good jobs for Alaskans. We will also take care to ensure that a natural gas pipeline would cause minimal impact on sensitive arctic environments. In the 63 pages, from cover to cover, you will find excerpts from the now famous Oprah, Barbara Walters and Rush interviews along with so much more. I could continue to review the magazine for you, but I would rather you read it for yourselves. However, I will give a few more tidbits. To my surprise as I first flipped through the magazine looking at the pictures, I ran across another familiar face…my own. 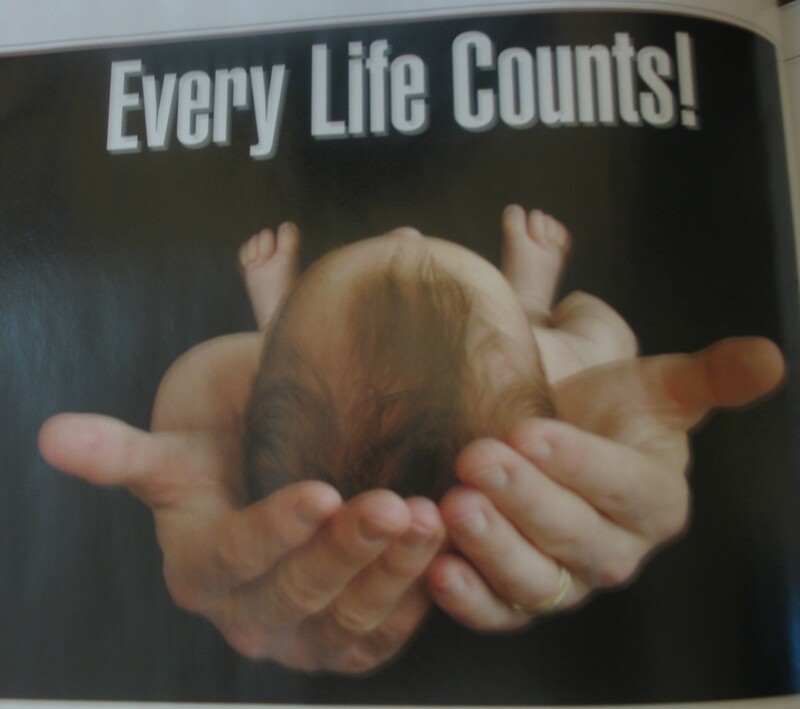 The picture below was taken at a rally in Fredricksburg Virginia in late October 2008. There beneath the text in the lower right hand corner is me (look for the red box). 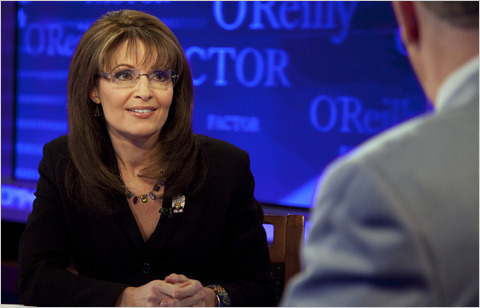 You will also find Sarah’s views on the economy, health care reform, the sanctity of life, the military, and the world. 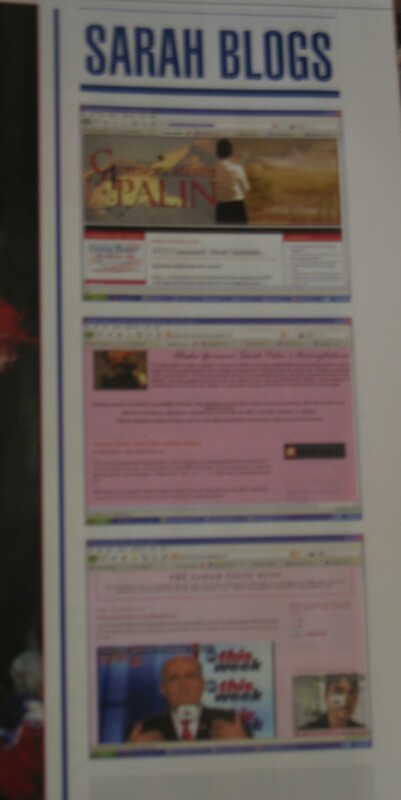 In addition, there is a short list of Sarah supporting blogs! If you know anyone who needs to know the real Sarah, please hand them a copy of “Historical Moments in Time: Sarah Palin” as well as a copy of Going Rogue! Todd and I join the world in extending our thoughts and prayers to the victims and families of those so impacted by the earthquake in Haiti. Our hearts are with the people of Haiti as they rebuild their country. Join us in donating to the American Red Cross relief effort. To assist those in need, consider sending a $10 donation to the Red Cross by texting ‘Haiti’ to 90999. Click here for details. This embedder courtesy of Peter Schiff contains all seven parts of Glenn Beck’s hour-long interview with Governor Palin, who is also a Fox News Analyst. Governor Palin and Glenn Beck first spoke about trust and how so many in politics are not trustworthy. Governor Palin touched briefly on her Reagan Conservative principles advocating smaller government and a bottom-up, people-powered approach. Glenn Beck said that our entire political system, the media, the debt our nation is incurring is unsustainable. He said that we were on the cusp of a major paradigm shift. Governor Palin noted that every 200 years something drastically changes in society, in a governmental system, and that from a historical perspective, we are due for a change. 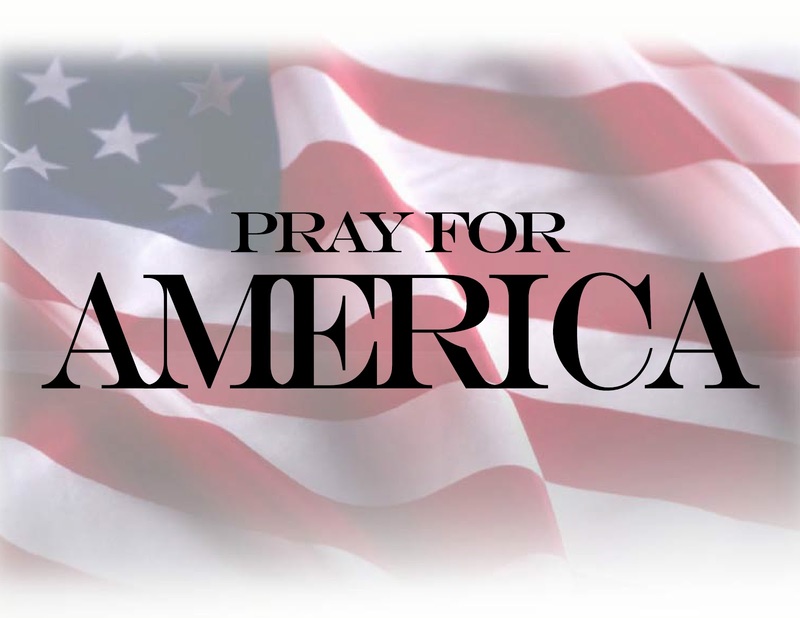 “There is nothing more important in my life than my relationship with God and my faith….I have been driven to me knees to seek His wisdom, guidance, His wisdom, His grace, and strength.” But…Governor Palin said, “I would never tell anybody else how to live. I’m never going to preach to anyone and tell them ‘you must do that,’ but I would like to see more Americans give it a try and seek that Guidance that our founding fathers sought that allowed them to craft documents then that allowed America to become the greatest, strongest, healthiest, most prosperous nation on earth.” Governor Palin said that our founding fathers — and mothers — intended that our nation be dedicated to doing good for mankind. When asked if she believes there are eternal ramifications to what we do here, Governor Palin answered in the affirmative. Glenn Beck preceded by speaking about our responsibility to warn others if we see something wrong. “What I do is not about me. It’s not even about my children’s future. It’s longer lasting than that,” Governor Palin said. In essence this interview was about trust. Who do you trust to stand up and do the right thing? To be our nation’s Commander-in-Chief? To be a steward to our Constitution and our Constitutional rights — all of them? 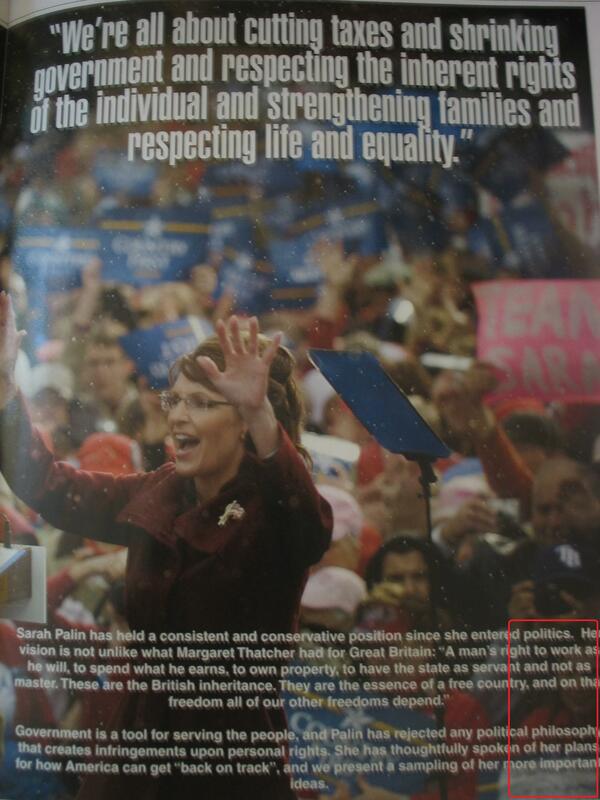 For my part, I trust Governor Palin completely and absolutely — with my very life — because she has earned that trust.